Rachel was born in Austin, Texas, to Debra and Brett Hurt. She is currently 13-years old and in 7th-grade. Rachel has been exposed to many important facets of life, here in the US and abroad, that have helped to shape her dreams and goals in life. 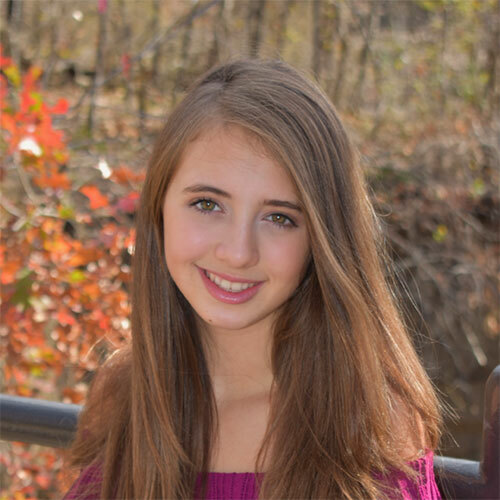 She has a passion for writing, and was an aspiring author, so for her most recent project, she wrote, Guardians of the Forest, a beautiful book for children ages 6-14 (more details are available at https://www.guardiansoftheforestbook.com). She gave the proceeds from the 1,000 Limited-Edition copies to the Andy Roddick Foundation, which helps thousands of underserved children each year. On Jan. 22nd, Rachel read her new book to two classes at the Harris Elementary School library, home of the largest and most diverse number of refugees of any elementary school in Austin, and participated in Q & A with the children afterwards. Then the Andy Roddick Foundation hosted an adult reception later that night where Rachel signed, and read excerpts from her book, in front of regular donors to the Foundation as well as followers of it via Facebook Live. Rachel is an accomplished speaker, including at TEDx. She has been a judge panelist for a YPO Shark Tank competition. She has also been a co-judge to Brett as well as Josh Baer (founder of Capital Factory) and Bob Metcalfe (founder of 3COM) at HackTX, University of Texas at Austin’s Hack-a-thon (reportedly the largest in the state). IBM chose Rachel to judge a startup competition at 2016’s SXSW as well. Rachel is involved in some of the early-stage companies that Debra and Brett are investors in and her activities have included attending investor update meetings, such as Blue Avocado’s, and reviewing products and visiting manufacturing sites like Deep Eddy Vodka (Rachel was their “Official Honey Taster” prior to the acquisition of the company). For her 10th & 11th birthday, in lieu of receiving birthday presents Rachel raised and donated all of her birthday money to Austin Pets Alive and the Austin Zoo. She has a very philanthropic heart. Rachel loves to travel and is very worldly. Since she was seven she became a pen-pal with Lydia, who lives in Kenya and attends the Kibera School for Girls, where Rachel helps to support her and send her to a private school. Rachel is very passionate and caring, and enjoys being with and helping other people. She seeks opportunities for growth, and approaches new challenges with strong enthusiasm. She is an inspirational speaker and wise beyond her years. She is a young Conscious Capitalist!